Those special ladies that brought you into this world have one of the toughest jobs possible. They are there each and every day to help you with your problems, take care of you when you’re sick, offer advice when you need it, and provide a shoulder to cry on when life gets you down. Much like your mother, Gravitate’s Client Service team is here to help you whenever you need it, in whatever way we can. Now, full disclosure: we here in Gravitate’s Client Service team technically are all male, and have never birthed a child—but we do our best to emulate that special brand of support and attention that Moms provide. With Mother’s Day right around the corner, what better way to celebrate than giving you the top reasons why your website service team is just like your mother. It seems like kids are always getting sick or injured. Fever, Flu, skinned knees, bumps, bruises—it’s a wonder sometimes that we even make it to adulthood. But your mom was always there to kiss an “owie,” put a bandaid on your cuts, and prepare the greatest remedy of all: chicken noodle soup. Websites can get sick too. Viruses, malware, hackers, spam and broken code can all affect your site’s functionality and user experience. Our Client Service team is always there to help protect your site’s security, fix code errors, and remove harmful viruses and malware. We take care of your site so that it can function properly and play its vital role in helping your customer base grow strong and healthy. Moms seem to be masters at remembering everything for their kids. Your blood type, Social Security number, favorite foods, favorite toys, what time your soccer practice is over, when your project is due. And they often do this for multiple children. Being able to fit all of that information in their brain is a truly remarkable feat. We will do the same for your site. Hosting your site on our reliable servers, keeping track of your login information, and backing up your site files. We make sure that you have peace of mind and don’t have to worry about accidentally deleting information, or forgetting your logins. When that math problem became too tough, who was there to help you carry the 1? When you were writing that English paper, who checked your spelling and grammar? When you were building your science project, who helped you build that baking soda volcano? We’re there for you and your site in just the same way. We routinely audit your site for spelling, grammar, readability, and general user flow. We help with creating new pages and editing site content. We design graphics, tweak site artwork, and rescale pictures. Mother knows best. A three word phrase that couldn’t be truer. When you need advice on how to deal with your teachers, the first person you go to is Mom. After that break up, the first shoulder you cry belongs to Mommy. Heck, whenever you need to just have someone to talk to, who you gonna call? Your Mother, buster. Our Client Service team is there for you in the same way. Whenever you need site support we are available to troubleshoot your issues. If your site has an emergency, we are just an email or phone call away to get it back to tip-top shape. Need advice on how to improve your site’s user experience or page speed? We can provide regularly scheduled audits to suggest ways to make your site better and tuneups to keep it running smooth. 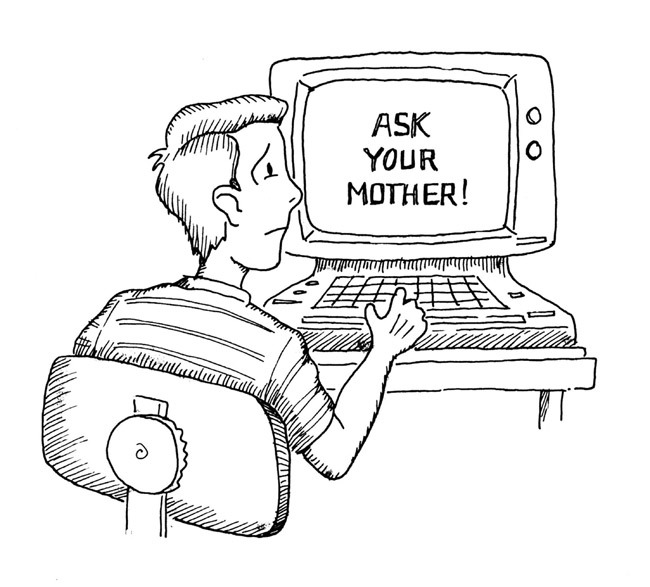 With Gravitate’s Client Service team, you kind of get a “Mom” for your website. We provide support, service, and maintenance to keep it healthy and happy. We are always looking out for ways that we can improve your web presence and are there for you whenever you need anything. Well…..almost anything. We don’t offer a shoulder to cry on. For that, you’ll have to go to Mom.